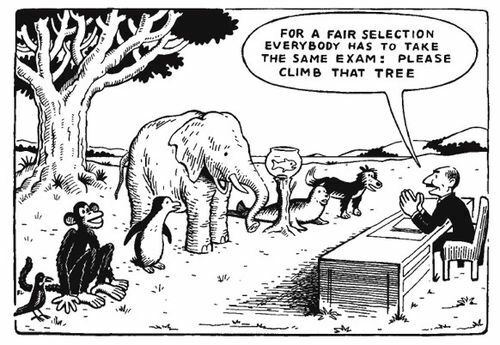 For this semester, the topic I focused on in my various essays was how the current United States Education System was unfair and did not do what it was designed for. For the first essay I wrote a definition paper in which I focused on telling the history of the problems in the educations system and establishing what problems exist within it. I first told the history of education, or at least what I was able to find up until today. Then I talked about quite a few problems involved with the education system in the essay a few being how the style of teaching originates from how factory workers were put to work a long time ago and still is the mainstream method of teaching. In essay two I wrote a rebuttal in which I mostly focused on discrediting an article I found online that talks about how the American education system is simply the best out of all the other countries. I used various articles to disprove many points that were made about how exactly the American education system was better than others. for the third essay I am redefining the problem that persists within my topic and then coming up with numerous ways in which we could solve some of the problems our at least make them better. To begin I like to do a general search to see If the ideas I come up with for the essay have sources that can support my claims. I found that using databases for my research was actually a waste of time because while they could filter through many articles quickly, most of those articles were so specific that they could not be used as research for my topic but actually would waste time searching for nothing. For the most part, I never really had to look for sources daily or anything like that, thankfully. When I did find sources if there aren’t any that support my way of thinking or if the research disproves my previous thoughts I change them but if there are enough to support them then I continue on to my next step. I make a bullet point list of ideas that fit along with the main point of the essay, that I will use for reference when I actually start writing. Then I like to explore those ideas and come up with as many points that I can with them. This makes up for most of the ideas that I make in the essays. Then for most of the main points I make I look for research that supports my specific points. For the most part this is really all I did for all the essays, the only other thing I did for some of them was put in my own personal connection to whatever point I was making to demonstrate to the audience a real life connection in relation to my point. Was the USA ever the best at education? After all my research my opinion hasn’t really changed much from start to finish. In fact It only became more apparent to me that what I thought was just a simple problem was actual a much bigger problem than I thought. The reason for this is that through my research I discovered that for many people, the things I thought were clear problems never made them think of it as a problem even though there is clear research, media, and politicians that say otherwise. I think for many people its easier to just live in a figurative bubble than to accept that sometimes what they believed for many years was in fact not true. I would have to say that throughout my research that is the new main idea that I have discovered regarding my topic. Though my thought on this is that it is better to just pop that figurative bubble and face the truth than forever live in ignorance. I planned to create a causal argumentative essay for the essay #2. Within my general topic, the effect of technology, I would consider the causes or consequences of trends related to the topic. I would focus on some specific topic, such as how technology influences the communication, especially the social skills in teenagers, or how the education system is affected by technology. I would try my best to avoid any kind of logical fallacies in the reasoning. I would judge on whether the benefit of technology outweighs the costs (negative effects) or not. I would look for sources and point of views from multiple aspects, such as parents, teachers, people who uses technology a lot and those who doesn’t. For the pre-writing approach, I used to outline what I want to say on paper and organize them into the cause-and-effect chain if possible. Then, I’m freewriting whatever comes to my mind around the outlined list I have. Next, I add source in between to support my argument and make a connection to it. For my second essay, I plan to write a rebuttal argument about opposing views on my topic. I would most likely approach the argument with a counterargument since there are two sides to my topic. There are those who want Ukraine to join the EU and become an “actual” member of Europe, and then there are those who want Ukraine to stick to its communist roots and let Russia decide the country’s future. Both the pro-European and pro-Russian sides have many reasons for backing their opinions so it wouldn’t be too hard to make a rebuttal against the pro-Russian side of my topic. I will try to limit repeating reasons why Ukraine should stay closely aligned with Europe since that is what I wrote about for my first essay. Instead, I’ll create counter-arguments for a claim (or claims) that is for Ukraine to be pro-Russian. I would research the reason behind the pro-Russian opinions of the opposing view and why they have those views. By creating a rebuttal argument, I would create arguments countering those claims. Overall, I would still focus on my position, but I would spend most of the time writing about the side that I oppose. The picture above shows someone holding a Russian flag among many people holding Ukrainian flags. This picture gives a visual of the two opposing viewpoints; the pro-Russian side and those who want Russia out of Ukraine. Markham, Isobel. “Ukraine Soldiers Defecting To Pro-Russian Side?” Bustle, Bustle, 25 Apr. 2018, http://www.bustle.com/articles/21325-ukrainian-soldiers-defecting- to-pro-russian-side-apparently-which-isnt-great-news-for-ukraine. Visual Assignment: Marijuana a Deadly Drug? Marijuana is considered a Schedule 1 drug which is as bad as they get. American RSDHope says, “SCHEDULE 1 (CLASS I) DRUGS are illegal because they have high abuse potential, no medical use, and severe safety concerns; for example, narcotics such as Heroin, LSD, and cocaine.” As many people already know, marijuana does have medical uses and is being legalized for medicinal purposes in many states. As far as severe safety concerns, I think this chart displaying the death toll of various substances says a lot about the “severity” of marijuana use. Looking at the data alone you can’t see the bar for deaths caused by marijuana overdose. Even if you could see the bar, it would be lost under the shadow of the overwhelmingly large number of deaths caused annually by tobacco, a drug that you can easily purchase if you are of legal age in any state. The number of people who die because of tobacco does not only include those who directly use the substance. This number also includes those who take in the substance second hand. In comparison to the other substances, marijuana is the least deadly. For my second essay, I plan to follow the ethical approach of my topic and focus on how veganism affects the environment as well as animals. By focusing on the ethics of this issue, I will describe how animal production impacts the land and atmosphere of the earth, as well as how the animals consumed in most diets are treated and produced. I will begin by finding statistics sources that expose the detrimental effects of modern animal agriculture. These sources, one of which I linked below, are the key to supporting my claim that veganism is the most ethically responsible lifestyle. I can also talk about how veganism can go beyond eating, but also our skin care and clothing as well. Many people do not even view their leather belt as once being an animal because society is so detached from production. By making the reader realize how we use innocent animals to our advantage, I can persuade them that being a vegan is a much more ethical choice. “New Report Reveals the Environmental and Social Impact of the ‘Livestock Revolution’.” Stanford University, 16 Mar. 2010, news.stanford.edu/news/2010/march/livestock-revolution-environment-031610.html.